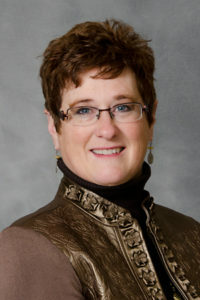 Gretchen Gregory, MSN, RN has authored simulation cases for many interprofessional exercises. She has served on a multidisciplinary steering committee and is actively involved in the development of a four-week interprofessional curriculum in patient safety, quality improvement, and teamwork with a student enrollment of approximately 250 students from five disciplines. She served as a facilitator for small group work and a high fidelity hybrid simulation session within the course. She also developed and co-coordinated a “safety seal” multi-professional student experience with environmental safety as the foci in the simulation lab for 250 students. This interprofessional curriculum simulation project provided the students the opportunity for application of knowledge and tools acquired during the course, while addressing real, important, and high-value improvement initiatives in academia. Gretchen has also developed and co-coordinated interdisciplinary experiences (medical students and pharmacy students) in the clinical setting with quality improvement and fall safety as the foci. Data was collected and statistical analysis performed in all three of the projects. The most recent interprofessional project has been the Partners in Education and Partners in Care program with the first year Medical and the Accelerated BSN students. The topics developed included: Interprofessional teamwork/effective communication, introduction to patient safety and quality improvement, health literacy, cultural humility, healthcare ethics and handoff communications. This program includes 102 medical students and 49 accelerated nursing students. One of the cases Gretchen co-authored was a session on cultural humility, an innovative low fidelity simulation with multicultural approach with the foci on culturally effective care. She has partnered with the Josiah Macy Foundation and Institute of Healthcare Improvement (IHI) to develop interprofessional experiences for medical and nursing students. In 2011, she and her team received the Duncan Neuhauser Curricular Innovation Award in Healthcare Improvement for Interprofessional Safety Simulation. Gretchen, along with Carla Dyer, MD and Erica Ottis, PharmD were award the President’s Award for the Intercampus Collaboration in 2014. IThat year she was also funded about $800,000 by the Josiah Macy Foundation in a conjunction with the University of Washington and the University of Virginia to utilize a business model to develop a sustainable faculty development interprofessional training center.